Both our Coin Counting Station and our Coin Counting Tubes offer an inexpensive, easy way for you to count and organize your coins. All of our Money Handling Supplies are in stock for fast shipment. Designed for use with Coin Wrappers, our Coin Counting Tubes are standard bank colors for quick and easy sorting. This four Coin Counting Tube set includes coin size tubes for pennies, nickels, dimes, and quarters. 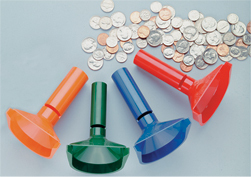 Made of a durable molded plastic, the Coin Tubes set includes 20 pre-formed Coin Wrappers. Feel free to browse our other Money handling Supplies including Coin Trays.